The Church of the Assumption of the Blessed Virgin Mary, to state it's full name, is a really wonderful 13th century building. This rectangular church has undergone many changes over the years. 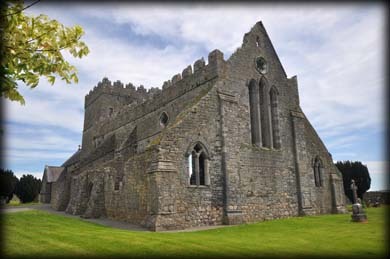 The original chancel was removed and replaced by a 19th century Parish Church, the superb central tower was vastly modified in the 14th or 15th century and the crenellations were added to the church. 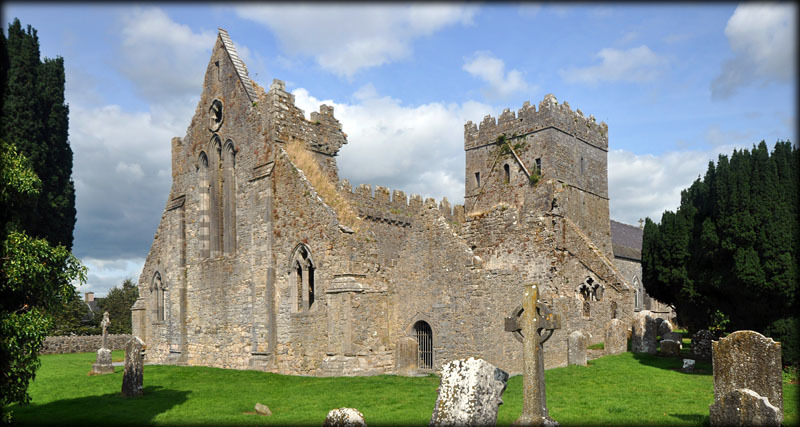 The church was served by a college of clerics, rather than monks, who lived in a nearby house. A few of the many masks to be found throughout the building. The Parish Church at the eastern end of the building is only open to visitors during the summer months, Mid-May to August, and even then it is closed on mondays and tuesdays. I dropped by in early May but still thoroughly enjoyed my visit. There is a vast array of medieval carving to to be found throughout the building. I don't recall ever seeing such a large number of masks, except on romanesque doorways, on any other ecclesiastic building. 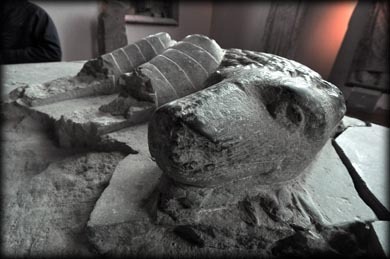 I will definitely call back during the summer months to view the splendid 16th century Butler tombs, decorated with weepers and effigies of armoured knights, a couple of 14th century effigial slabs and a cross inscribed ogham stone present inside the Parish Church. The images below are from several trips to Gowran in 2018. 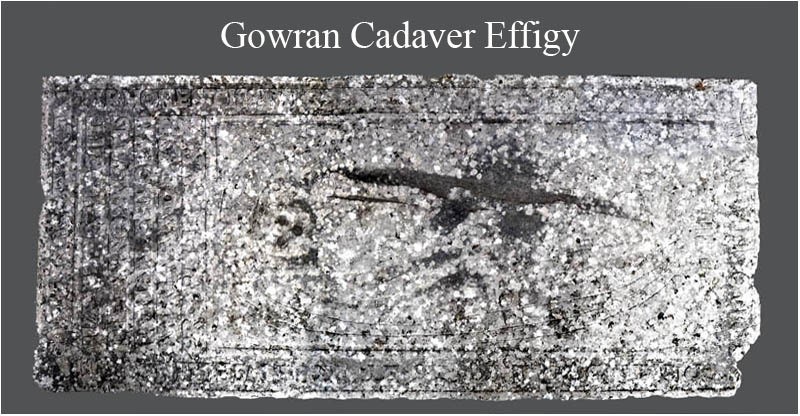 There are a number of effigial tombs are situated in the chancel at St Mary's. Two of them are altar tombs. The first one pictured above bears the damaged carving of an unkown Butler knight. The sides of the tomb are decorated with carvings of the twelve apostles and the Butler coat of arms. resting at his feet is his dog, a symbol of loyalty. Two the west of the single altar tomb is a double tomb. 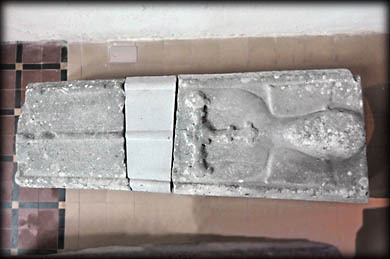 It features the effigies of two unknown Butler knights. 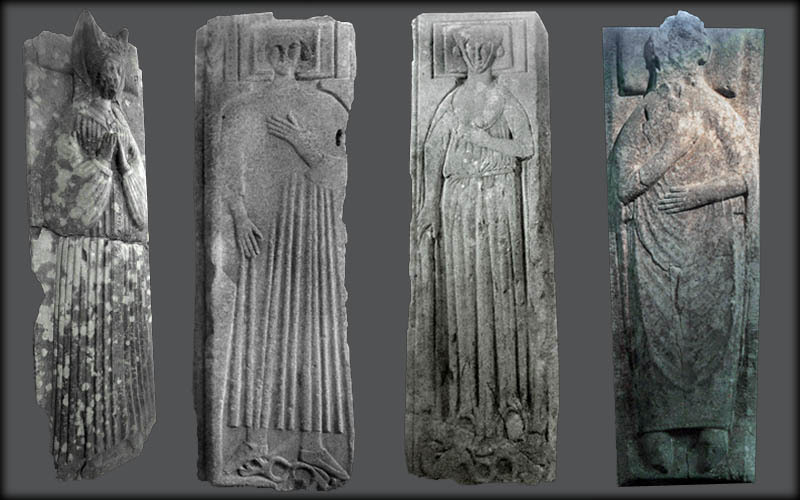 It is believed they are 15th century carvings depicting Butlers from Paustown or Neigham. There feet are also resting on there loyal dog. 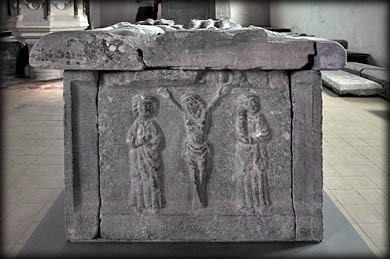 The crucifixion, below left, appears on the west end of the tomb. Effigies above from Left to right, possibly Sabh Kavanagh, mother of Piers Butler the 8th Earl of Ormond. James le Butler 1304-1338, first Earl of Ormond and his wife, Eleanor de Bohun 1304-1363. 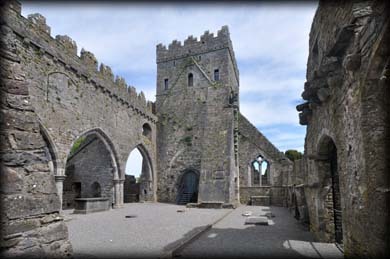 Radoulfus d.1253 the portrieve (priest) of Gowran in 1218. 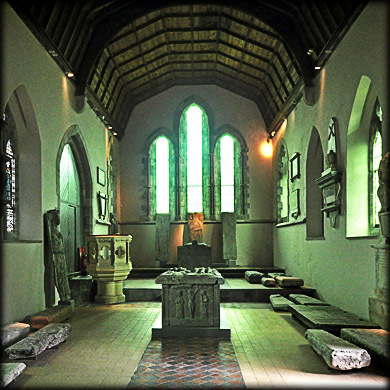 Nestled in the north west corner of the nave is the, 17th century, tomb chest of James Kealy. Run your mouse over the above image to real the latin inscription carved on the mensa. The inscription surrounds a shrouded skeleton. 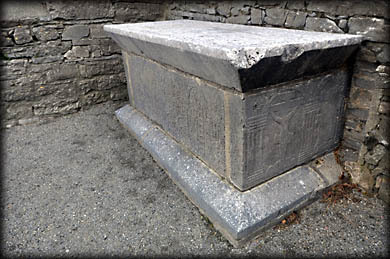 Most of the early, Irish 15th/16th century cadaver tombs, depict a specific persons decomposing body within an open shroud, see Rice tomb. But the later Irish momento mori tombs -reminder of death after 1571, bear a skeleton as a representation of death rather than any specific person. 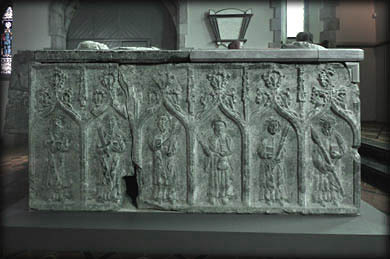 The sides of the tomb chest are richly decorated with carvings including a crucifixion and figures, one of these represents St Patrick. The MAQ strokes have been chipped away at the bottom of the dexter angle. 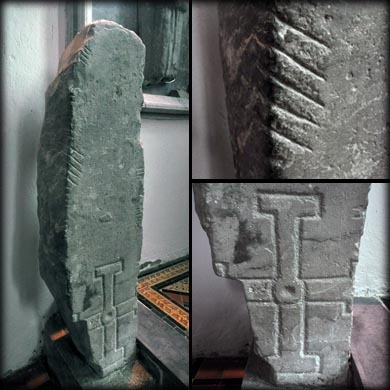 The ogham stone has been Christianised with the addition of a large cross potent, carved at the bottom of the inscribed face. This is similar to the ogham stone at Dromkeare, County Kerry. 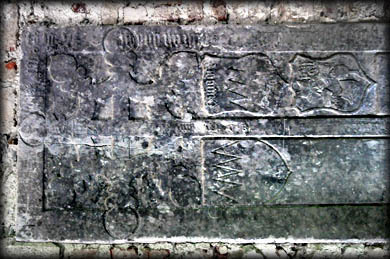 A fine collection of medieval cross slabs are also present at St May's Church. Most of them are lying on the floor in the chancel, others are lying against the walls. You can see a number of these in the image shown right. 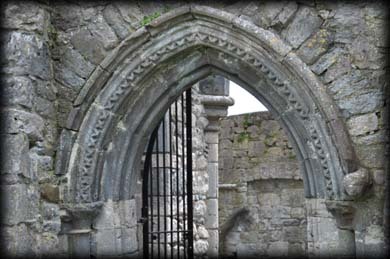 The slab below, is fixed upright on the north wall of the tower, it bears an eight pointed fluoridated cross with the coat of arms for the Ormond family and below it is a shield with the Purcell and Rothe families mentioned. Another memorial monument commemorates James Kealy and his wives, Ellen Nash and Mrs Mary White, his second wife. He may be the James Kealy commemorated on the cadaver tomb. 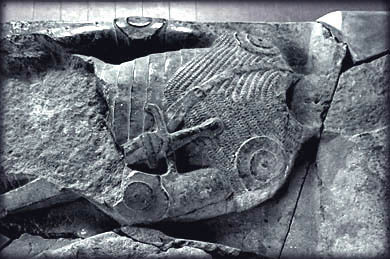 A slab, below right, lying on the floor of the chancel, bears a carving of an upper body and a sword. Situated: Very easy, located in the centre of town on the R448. Parking nearby. The church is open from mid may-till the end of August. Wednesday to Sunday inclusive. Discovery Map 68: S 6331 5348. Last visit May 2018.